One of the biggest bugbears for my colleagues in the newsroom is the use of corporate jargon. As journalists we receive a steady stream of emails and press releases, most containing information that is of the public interest but often containing fashionable buzzwords that the our readers simply don’t understand. It has become a daily but necessary battle to translate this ‘jargonese’ into everyday English so our readers can understand what they’re reading. 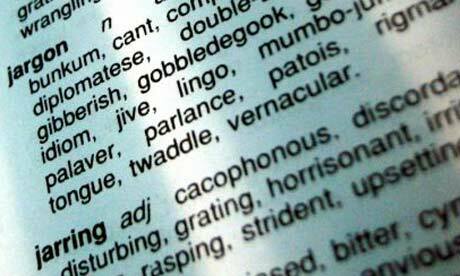 Even the Local Government Association (LGA) has acknowledged local authorities’ overuse of buzzwords and published a list of 100 jargon terms that it urged councils to stop using back in 2008. These included: core value, community engagement, service users, value-added, pathfinder, coterminosity (even Word spell check doesn’t like this one), symposium and synergies. After releasing the list, LGA chairman Margaret Eaton said: “The public sector must not hide behind impenetrable jargon and phrases. Out of curiosity, I went straight to my local county council’s website to see if they had taken heed of this invaluable advice but unsurprisingly, the answer was no, not really. A simple search showed most of the terms were still littered across its web pages; there was even a section headed ‘community engagement’ – one of the top 100 banned jargon words – along with a list of ‘community engagement officers’. Another visible trend is libraries being referred to as ‘gateways’ and village halls as ‘community hubs’. So what is the obsession with using grandiose jargon? Yes, maybe it makes these facilities and services sound a bit more modern and hi-tech, but what is the point if the authorities own ‘service users’ don’t understand the words themselves? If you stopped the average man on the street and asked him to define the terms ‘gateway’, ‘community engagement officer’ or ‘community hub’, I’d put money on there being a blank expression on his face in response. While authorities persist in using jargon, for journalists and content writers it just means we have to be more diligent in our interpretation of these alien terms, not only for the benefit of our readers but in order to defend the English language. Last weekend I discovered a stretch of shoreline, a short drive down the coast from Folkestone, called Samphire Hoe. 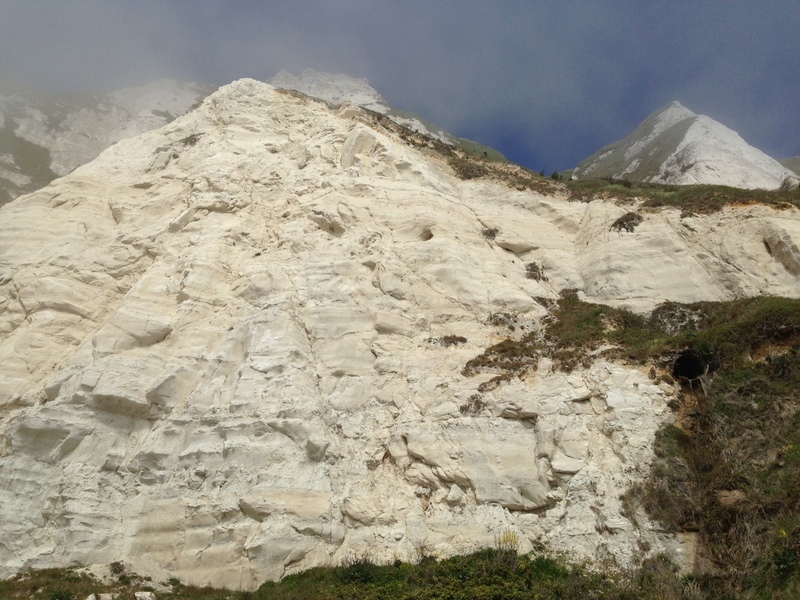 As a Whitstable native, I’m relatively new to the south coast of Kent but as it happens so is the 35 hectare stretch of coast, having been created in the early 1990s from some 4.9 million cubic metres of chalk dug to create the Channel Tunnel. It made me wonder what the French did with their half! Apparently it was given it’s name by a retired English teacher and refers to Rock Samphire, a plant which is lovely to cook up with some fresh fish and ‘hoe’ meaning a spur of land. 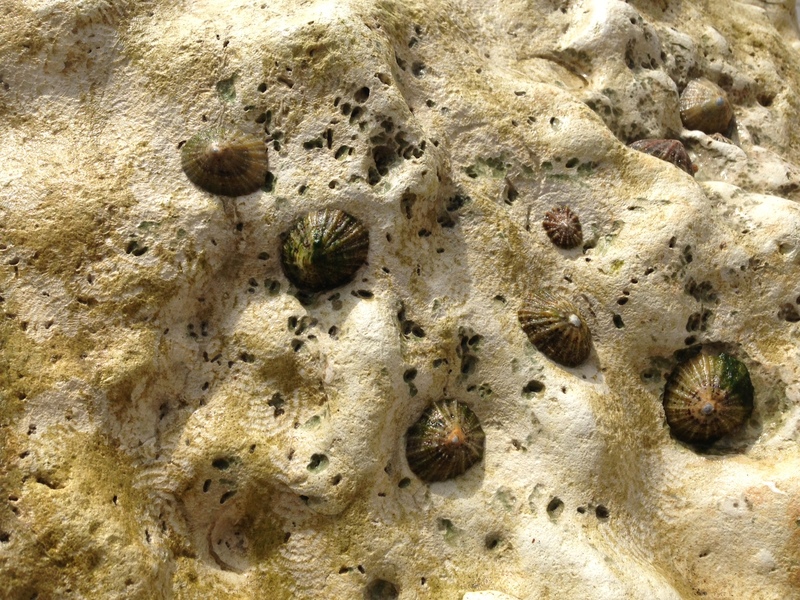 After taking a walk through the nature trail, I arrived at a stretch of beach hoping to find some samphire to fill my bag with but all I could find at the rock pools were barnacles and seaweed. I also passed a bloke who was sitting rather proudly on the seawall with a perfectly spiraled ammonite fossil while his offspring bashed away as a clump of chalk with a claw hammer. Despite being a sunny day, there was a thick fog hanging over the sea and the cliffs, giving Samphire Hoe an eerie, magical feel – although the lighthouse’s fog horn rather spoiled the peace and serenity! I’ll definitely be going back sometime soon, hopefully on a clear day, but I’ll forget about finding elusive salty plants next time and focus on finding some fossils. A front-runner for this year’s story of the year is already the ongoing horse meat scandal. In the past week, we have already seen Swedish retail giants Ikea withdraw the much-loved meatballs from all of its UK and European stores. Meanwhile restaurateurs Whitbread and frozen food firm Birds Eye have also fallen foul (or should that be foal?) 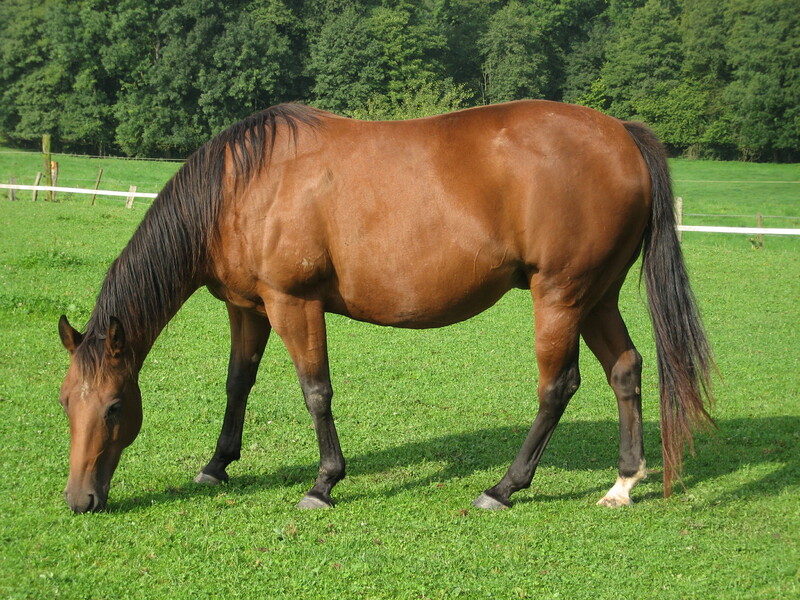 of the furore that followed horse DNA being discovered in Tesco burgers in January. Outside Europe it emerged that Black Beauty and Red Rum may be slightly safer in South Africa after no traces of horse were found in burgers and sausages. But it wasn’t such good news for Eeyore and Three Billy Goat’s Gruff after they discovered traces of donkey, goat and water buffalo meat instead. While the companies caught with the products on their shelves have been quick to point the finger at the slaughterhouses in Eastern Europe, surely the blame lies with the stores themselves for selling the meat without testing it in the first place. They are the ones who have been making the most money from selling the incorrectly labelled meat, and it is their duty to ensure the quality and origin of the products they are putting on people’s plates. Aside from that, another interesting and important point is that experts have predicted the practice of mislabeling of meat may have been going on for years. The likelihood is that the majority of us have probably eaten horse meat at one time already, albeit unknowingly. So it does raise the question, has it actually done us any harm? And should it stop us eating the things we used to? I for one, will probably be dragged to Ikea on a quest for tea towels and bookcases in the near future. The reward for being laden with pillows, flat-pack boxes and having my bank account emptied, always used to be a trip to the Ikea restaurant for those gravy-covered meatballs with chips and loganberry sauce. And in all honesty, I can’t see that habit changing. I liked them before I knew they contained horse so I’d probably canter back to eat them again. One of the key influences in my decision to become a journalist was Hurricane Katrina, the devastating disaster which hit the southern coast of America in 2005. I’ve always seemed to encounter bad luck abroad; narrowly avoiding the Indian Ocean tsunami, getting robbed in Costa Rica, and getting caught up in a military coup in Thailand. But through no fault of my own, the flight I boarded to Louisiana arrived on the same day as the deadly hurricane which killed more than 1,800 people and caused $81 billion (£52.5bn) worth of damage. Although I was initially diverted to Texas, I travelled back into Louisiana and spent a month witnessing the damage, devastation and heart-break firsthand. A fortnight into my stay I finally went into New Orleans itself. As I neared the outskirts of the city, the first signs of the disaster were clear to see. Huge swathes of trees had been stripped bare of their leaves by the strong winds. In the outer suburbs there are mountains of broken refrigerators, televisions and other electronic goods left on the street corner. In every other neighbourhood there was a gap where a house once stood. One resident had painted a warning to potential looters on the front of his house. It read: “01/09 Don’t try. I am sleeping inside with a big dog, an ugly woman, two shotguns and a clawhammer.” A second sign, below read: “04/09 Still here. Woman left Friday. 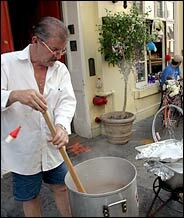 Cooking a pot of dog gumbo.” It was nice to see some people hadn’t lost their sense of humour despite the hurricane. In the heart of the city the streets were empty and eerily silent. The muggy air was filled with flies and the stench of rotting uncollected rubbish, which is piled high on every corner. Soldiers lounged about in a makeshift camp they had set up in the grounds of a deserted university campus. Several cars were crushed flat by brickwork that had fallen from an office towerblock. A dirty line was still visible on the walls of the boarded-up buildings, more than 8ft high – marking how high the water reached before it receded. In the late afternoon, close to the French Quarter, I found a bar and restaurant called Alex Patout’s that was still open. The owner Finnis Shelnutt (pictured above – I’m in the background wearing a blue t-shirt), had braved the storm and every evening he cooked jambalaya in a big metal pot for up to 100 servicemen and women carrying out the clean-up operation in the city. A homeless man, who introduced himself as Dr Love, arrived on a bicycle wearing a torn vest covered in Biblical proverbs. Some journalists gave him some of their pizza, and he sat down to talk with us before falling asleep in his chair. I was joined by two Belgian journalists reporting on the hurricane for a newspaper in Brussels. They were amazed by the generosity they had encountered. When they were thirsty, a shopkeeper whose store had been destroyed gave them bottles of Coke but refused to take their money. Other residents they had interviewed had offered them food despite the fact that they had lost everything. The hurricane had ruined peoples’ homes but it hadn’t destroyed their spirit. It was heart-warming to hear and witness people’s kindness despite the tragedy, and to see solidarity and humanity at its best.